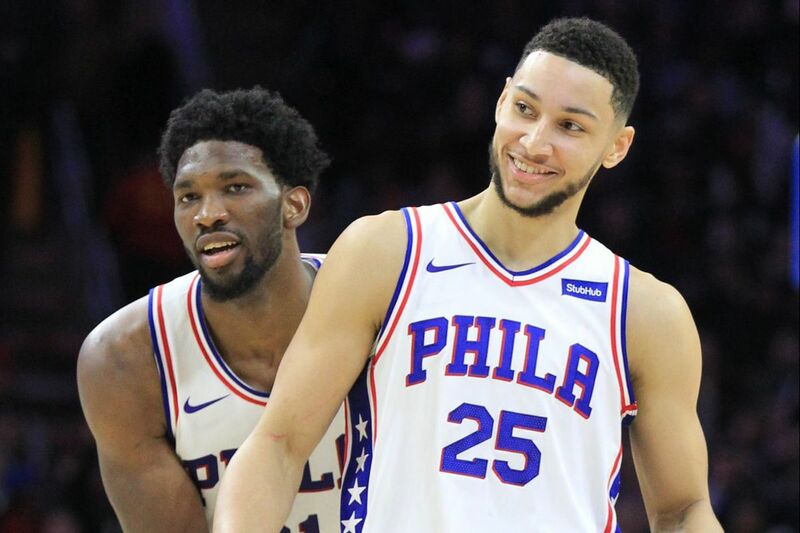 Joel Embiid, left, and Ben Simmons celebrating after a play in December. There are nights when you watch the Sixers on their home court and wonder how so many people could have been so wrong. Or maybe you don't wonder. Maybe it is the most human of all outcomes: a lack of vision, an inability to accurately gauge the consequences of our actions, the insistence that one marshmallow now is worth the sacrifice of many more later. Whatever the case, the scene at the Wells Fargo Center on Wednesday night was another glimpse at the materialization of a future that was always more imminent than not. There were Franco Harris and Evander Holyfield sitting behind the baseline and Cole Hamels getting a standing ovation and a couple of Australians explaining to an arena full of Americans how to eat something called a meat pie. Most of all, there was the basketball, a wire-to-wire victory so thorough that it prompted a frustrated Bulls team to wave the white flag with more than a few minutes remaining. In the middle of it all were the fruits of a process that just two years ago was the subject of ridicule. There was Ben Simmons, making full use of the size and strength of his frame, crashing the boards and putting the ball on the floor and orchestrating an offense that shot 52 percent from the field. That he finished with a triple-double is barely worth mentioning at this point: Through his first 43 games as a professional, Simmons has five of them, already the most by a rookie since Magic Johnson in 1979-80. He arrived at this one 50 seconds into the second half, finishing with 19 points, 17 rebounds and 14 assists, thresholds reached in the same game by just one other rookie in NBA history (Steve Francis in 1999-00), and just eight other players of any age (Wilt Chamberlain did it 10 times; Russell Westbrook, 3; Larry Bird, 2; Magic Johnson, 2; Oscar Robertson, 2; and Draymond Green, James Harden and Francis, one apiece). When Simmons wasn't attacking the rim, the Sixers spent a lot of time running their offense through Joel Embiid in the post, and the effervescent 7-footer responded with one of the most efficient performances of his young career. In addition to connecting on 10-of-17 shots from the field, he turned in what his coach would later call one of his finest passing performances to date. A player who once seemed to spend much of his time running arc-to-arc and making things up as he went along increasingly looks like a veritable NBA big man, with a back-to-the-basket game that gets a new layer of polish with each passing week. Embiid's development in the post was exemplified by a series of three plays late in the Sixers' blowout win over the Bulls on Wednesday. Midway through the third quarter, the big man took an entry pass from Timothe Luwawu-Cabarrot with his back to the basket on the wing, squared up Robin Lopez, faked high, then exploded right on a power drive to the basket that culminated in a soft fadeaway shot on the opposite side of the basket. The next time down the court, Embiid pulled up from the right wing for a jumper that prompted a frustrated Fred Hoilberg to call a timeout. As for Brett Brown, the aspect of the performance that most impressed the Sixers coach Brett Brown was the one that was on display midway through the fourth quarter, when Embiid bodied up Bobby Portis in the low post and then let the game come to him, backing into a dribble that prompted Zach Lavine to double down, then calmly bouncing a one-hander to Lavine's man at the top of the arc. Luwawu-Cabarrot knocked down the wide-open three, and the Sixers increased their lead to 22. "If you double-team or triple-team, I've gotta do my part," said Embiid, who finished with three assists to go with his 22 points. "I've got to kick out and then trust my teammates to make it. I want them to make it, because if they don't make it, I'm going to stop passing." He said this the way he says most things, with the corners of his eyes crinkling and his Cameroonian accent amplifying his deadpan. Make no mistake, though: Embiid is transforming into a serious player, the kind of post presence capable of keeping a team competitive regardless of his accompaniment. "I'm still finding my way, but when it comes to one-on-one, I feel like I'm unstoppable," he said. "I've got so many ways to score the ball, but I've still got to keep the focus on turnovers, because I've been a turnover machine. When you get a lot of touches, a lot of possessions run through you, it's going to happen — when you look at the guys who lead the league in turnovers, it's LeBron, James Harden, Westbrook, so, it happens. Sometimes, it just happens, but I still have to do a better job. Sometimes, I'm just too loose with the ball." The energy that now surrounds the Eagles has pulsed through the Wells Fargo Center all season. They are 9-3 since Christmas Day, two games better than .500 for the season, outscoring opponents by eight points a night. They have two of the brightest young stars in the sport, each a potential history-maker in his own unique way. "The pain that we endured is actually producing some fruits of our pain," Brown said after the win over the Bulls. It's still winter in Philly, but spring time might not be far away.